Looking over Facebook Saturday morning I saw a number of posts about the recently reported death of artist Thomas Kinkade at the age of 54. One post in particular, made by my friend Leonard Koscianski, stood out. It mentioned Kinkade's death alongside that of Mike Kelley, a Los Angeles artist who took his own life at the age of 58 earlier this year. "First Mike Kelley, now Thomas Kinkade. Two California artists who were very popular in their respective milieu. I'm saddened by their deaths, but I disliked both of their work." Before his death by apparent suicide in early February, Kelley was working on "Mobile Homeland," an installation that was intended to recreate his childhood home in Detroit. In his final interview Kelley told Tulsa Kinney of Artillery Magazine that the subject was ..." almost too fraught with psychology and dysfunction...things that could easily feel like an emotional burden." The cottage, which glows as if it had swallowed the Star of Bethlehem, exudes a luminescent fairy tale vibe that Kinkade used as his shield against his life's disappointments. By painting fairy tales, Kinkade was attempting to achieve what Bruno Bettelheim posited was a "... happy outcome, which the child cannot imagine on his own." Kelley would have called Kinkade's approach "denial." Indeed, Kinkade expertly sugar-coated the subject matter of every one of his mass-reproduced images. No wonder one critic called them "visual Prozac." Kinkade reportedly died of "natural causes," which I assume is a sugar-coating of the actual factors; an autopsy is planned. The artist's public outbursts -- he once reportedly urinated on a Winnie the Pooh figure at the Disneyland Hotel in Anaheim while saying "This one's for you, Walt." -- and his 2010 arrest for drunk driving suggest that the man's demons were doing everything they could to burst out. Kelley, by potentially taking his own life, was characteristically honest. His apparent suicide was his admission of unhappiness, a problem that he had discussed openly in his key works. At the time of his death Kelley was reportedly depressed after a breakup with his girlfriend. Mike Kelly, "Deodorized Central Mass with Satellites," 1991/1999. Plush toys sewn over wood and wire frames with styrofoam packing material, nylon rope, pulleys, steel hardware and hanging plates, fiberglass, car paint, and disinfectant. 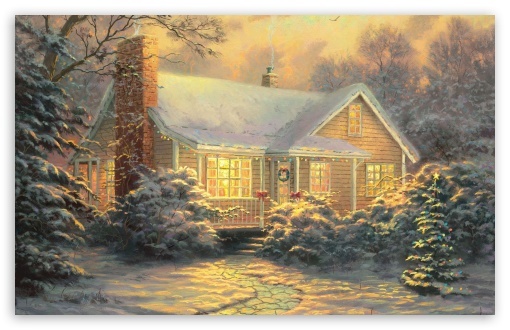 Kinkade's art and the product line that grew from it was so successful that his art company was publicly traded on the New York Stock Exchange, and at one point had a market capitalization of $350 million (the total value of the stock) based on annual sales of $250 million. Kinkade, who described the art world as "a very small pond... a very inbred pond," left behind a net worth that is in dispute. One source says "$70 million" another says the artist, who had faced lawsuits by the owners of Kinkade gallery franchises, died "piss-poor." At the time of his death, Kinkade and his wife Nanette had been separated for more than a year. 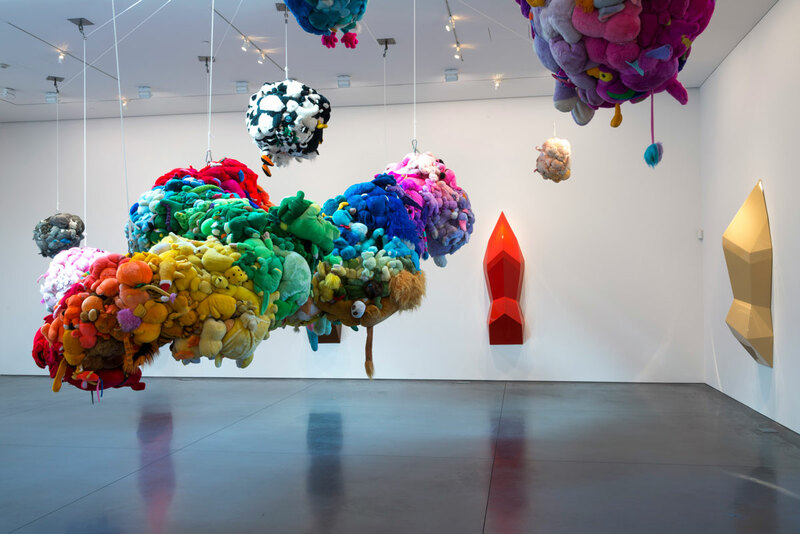 Kelley's bracingly strange and searchingly intellectual art appealed to America's 1%. Kincade's hyper-sentimentalism and his sanitized subject matter -- Christ, baseball, and fairytale cottages -- made him the favorite artist of America's 99%. They were two American artists who, in their striking divergence, tell the story of a nation whose center seems ready to tear apart. Stress makes people look for extreme solutions, both in life and art. Ultimately, both men seem to have suffered in catering to the almost schizophrenically divided tastes of American society. In public they both maintained powerful identities -- a bad boy and a good boy -- while in private each one got a bit lost trying to find his way "home" to private peace and reconciliation with his childhood experiences. It might be said -- in psychoanalytic terms -- that both Kelley and Kinkade ultimately failed to sublimate their impulses and idealizations into workable connections with the world. Both men had empty centers that they couldn't quite fill. "No. I never believed in anything."